Not to be confused with World 6-1. Area 6-1 is the first course of Cosmic Adventure and the forty-sixth course overall in Mario vs. Donkey Kong: Mini-Land Mayhem!. It also introduces the Magnet Blocks, a primary gameplay element which is used to walk on walls. 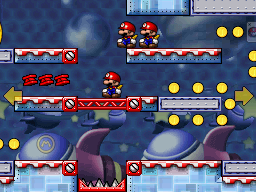 The Mini Marios begin at the top right on a platform on the upper level, with the exit door on the top left. In order to reach it, they must simply be guided to the Girder Pickups, then draw a Red Girder platform to it. The M-Token is located near the bottom left, atop a Magnet Block platform on the lower level. To collect it, a Mini Mario must simply drop down to a Red Girder platform on the lower level from its starting position. The Mini Mario Card is located on the top right, hanging just out of reach on the upper level. A Mini Mario must climb up the right Magnet Block wall from the lower level to reach it.